We will visit KENPOKU ART 2016 in Ibaraki Prefecture, as well as Mashiko pottery sites and kominka cafes, for a perfect blend of the modern and the traditional. 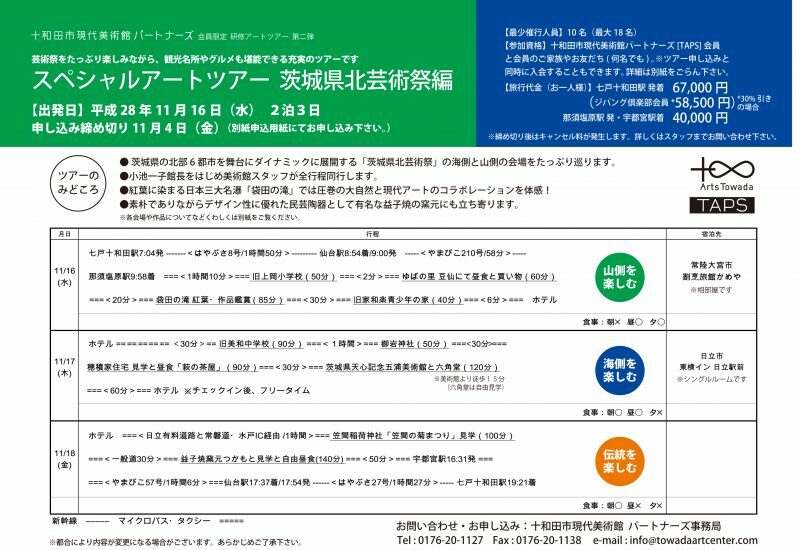 Towada Art Center director Kazuko Koike will also join for part of the tour, and KENPOKU ART staff will provide special descriptions of the works on display. Members are presented with many special opportunities to meet and connect with each other. Members are invited to all exhibition opening receptions, where they are able to experience a special atmosphere alongside other members and connect with the Towada art community. Members-only tours provide another chance for members to connect with each other through both art and travel. Members are also able to bring one guest with them to enjoy the museum together. TAPS is not just about what benefits you can receive as a member. Members also help to communicate the value of art to the next generation. A portion of membership fees are used to charter buses that bring local children to the museum to experience art and participate in workshops. By becoming a member, you directly help the museum give back to the community. As a member, you will be able to deepen your knowledge and understand of art through special members-only gallery tours led by artists and museum curators. These rare opportunities allow members to hear the stories behind the art, as well as the time to develop an eye for deeper art appreciation. ※Membership cards can only be used by the membership holder. ※Please present your personal or student ID (business card for corporate members) at reception or the cafe. Corporate members will gain access to benefits and events that cultivate a deeper understand of art while helping communicate the value of art to the next generation. Corporate members also play a large role in supporting the many projects that utilize the Towada Art Center. These include social and educational programs, as well as the development and advancement of local art and culture. Ｎ and A Co. Ltd.
To become a member you must (1) submit an application and (2) pay the initial membership fee. 1. Completed TAPS member applications can be emailed, faxed, mailed, or delivered in person to the address below. 2. Membership fees can be paid in person at the museum or sent via bank transfer. *When mailing your application, please include an 82 yen return stamp. *Your membership card will be mailed upon confirmation of your application and payment. Please allow some time for it to arrive. Towada Art Center volunteers, called Genbi Supporters, are another way you can help support the museum. Tasks are diverse, and volunteers serve as guides and guards, help with clean up, and even help with packing and mailing jobs. Volunteers also play a key role working together with museum staff for large exhibition-related events.